This book collects many folk and fairy tales from Norway, Sweden, Denmark, Finland, and Iceland. The stories are pulled from the oral tradition and thus vary greatly in length and level of complexity. Some are just a quick paragraph with a moral, while others are more of a short story length and feature fantastic descriptions, legendary characters, and so on. The stories retain an authentic-feeling voice--I can just picture an 18th-century goatherd telling these tales to a visiting folklorist. I was particularly interested in learning about Icelandic folklore, which often seem to feature troublesome elf-human interactions at Christmastime. I read some of the tales from other countries too. There's a wide variety, telling of trolls, elves, witches, wish-granting beings, princesses, and more. Some elements will be familiar to readers of fairy tales from other places, while others hint at particularly Scandinavian beasts, landscapes, and characters. "Oh, thousands of times have we played on the shore,And caught little fishes---dost mind it no more?We raced with the surf as it rolled at our feet,And the lurking old Merman we always did cheat. "Yes, much shalt thou think of at my lullaby,Whilst the billows do rock and the breezes do sigh.Who sits now and weeps o'er thy cheeks? It is sheWho gave thee her soul, and whose soul lived in thee. "But once as an eider-duck homeward I cameThou didst lie 'neath a rock, with thy rifle didst aim;In my breast thou didst strike me; the blood thou dost seeIs the mark that I bear, oh! beloved one, of thee. "This excerpt from the Finnish tale "Finn Blood" captures the spirit of the entire collection, but these stories are important for another reason; my favorite video games derive many of their plot lines from them. Great stories, and while the introduction describes Christianity as the "early and prime" faith of Scandinavia, some do retain elements of the pre-Christian folk spirituality. Its a pretty extensive collection. The organization is by country, which allows interesting characterization of the various cultures of the region. This makes a good reference book. but I don't see it as something to read cover to cover. There are a huge number of tales, and with the exception of a few by Andersen they are told in the vernacular, which can grow tiring after a while. This was ok, very dense, and an excellent reference book that I can't bear to let the library get rid of, even though our only copy is falling to pieces, but I think I wanted to read more about the mythology of Scandinavia, so this book fell short. Vast collection of tales from all over Scandinavia. 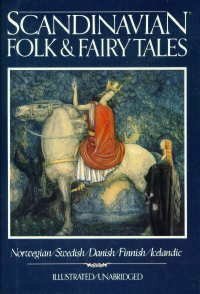 A wonderful collection of folk and fairy tales; you can see the roots of what inspired Tolkien and what continues to inspire Gaiman. Great collection of fairy tales! Anonymous Claire Booss - Books can be attributed to "Anonymous" for several reasons: * They are officially published under that name * They are traditional stories not attributed to a specific author * They are religious texts not generally attributed to a specific author Books whose authorship is merely uncertain should be attributed to Unknown.